Excellent multi tool from Joseph Joseph, this is a compact 3-piece set meat Baster and thermometer tool. The Baster helps you ensure that meat remains tender and moist while cooking, whilst the leave-in meat thermometer provides a clear visual guide to internal meat temperature allowing you attain the perfect cooking temperature for the meat being cooked. The third part of this set is a handy cleaning brush, which along with the thermometer, fits neatly inside the Baster for ease of storage. 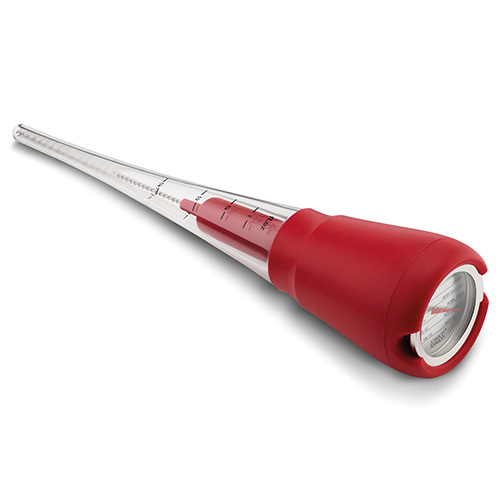 The Baster and Brush elements are dishwasher safe while the thermometer should be wiped clean with a damp cloth.